Stirling Council Provost Mike Robbins honoured local citizens at a civic awards ceremony on Friday 26th October at Stirling Castle. The awards are presented to local people and organisations who have made significant contributions in their field or to their community. 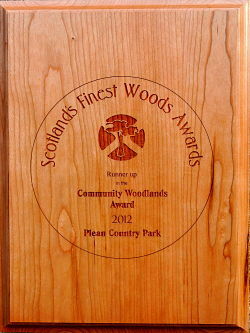 This year 28 awards were made across 9 categories and the Friends of Plean Country Park were delighted to receive recognition in the communities section for their work in conservation and promotion of the park. Representatives of our committee attended a drinks reception in the Chapel Royal followed by an excellent meal in the Great Hall where the presentations were made. It was a great evening and the invitations came out of the blue - we were not aware we had even been nominated!